Milk jam, also known as dulce de leche, manjar, or arequipe, is a confection made by heating milk and sugar until the mixture caramelizes and thickens. It's popular in South America; France and Norway also have very similar products. The Mexican version, called cajeta, is made with goat's milk. 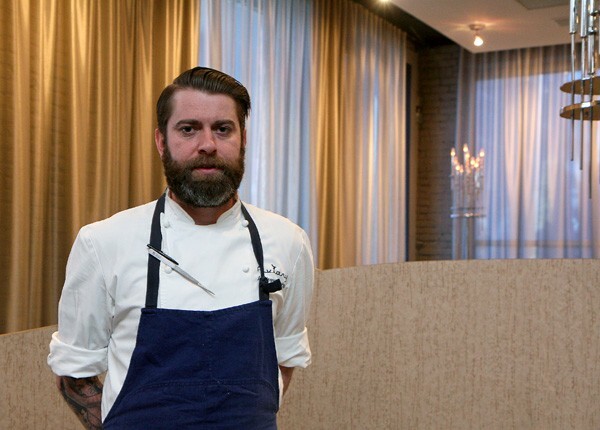 Andrew Brochu of the Aviary, challenged by Jeremy Brutzkus, pastry chef at Longman & Eagle, to create a dish with milk jam, started by questioning the definition of milk. "Technically milk is from a mammal, but . . . if you juice onions, it's onion milk. If you juice horseradish, it's horseradish milk. At least, that's the terms we use," he said. Brochu tried making milk jam with both. "Horseradish isn't the most pleasant thing to juice, because you're literally in tears," he said. And the horseradish "milk" never caramelized. Onion milk did, as did blue cheese jam, but "at the end of the day," Brochu said, "I ended up doing goat's milk jam, which is cajeta. It just tasted the best, and it worked with a dish that I'm already working on." To make the cajeta, Brochu simmered a half gallon of goat's milk with vanilla bean, cloves, and cassia buds (the unopened flowers of the cinnamon tree) for ten hours, until it was reduced from 2,000 grams to about 100. "I did add a pinch of sugar," he said. "I didn't want to, but after the first six hours I was like, maybe I need to help it along." Brochu called the finished product "extremely delicious. Really, really tasty. It's caramelized, but not oversweet . . . it's really funky." 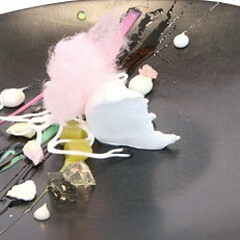 The dish he'd been working on was part of a tasting menu and designed as a two-bite transition from savory to sweet. 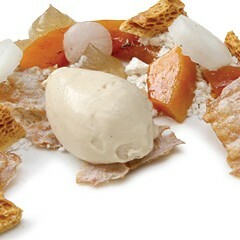 Originally it was "just coconut in multiple textures and forms," he said, but the cajeta added some richness. "It's a really simple dish. But it's kind of fun to take weeks and weeks and weeks to figure out something that's really not that hard." While Brochu plated coconut pudding (sweetened coconut milk thickened with Ultra-Tex), coconut custard (creme anglaise reduced with coconut oil), and cajeta, he explained that though the three elements of the dish were similar in texture, they had different mouthfeels. He also added coconut pickled with pear vinegar and black lemon (which Brochu said took on a bubble-gum flavor), coconut streusel, coconut jelly, and coconut ice. 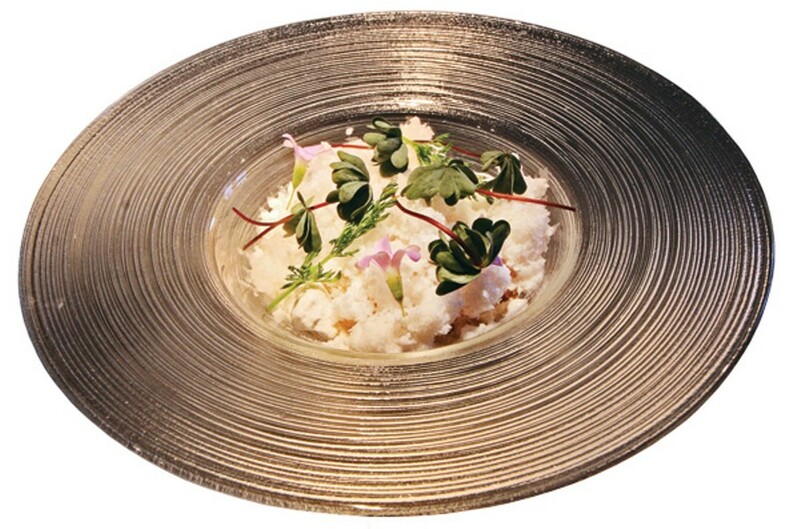 He topped the ice with sorrel flowers and silver oxalis, two very tart herbs that he said balanced out the sweetness and richness of the cajeta. 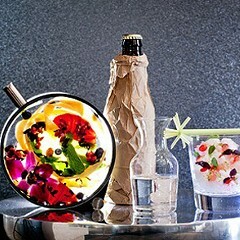 "Visually, it's 'Here's a pile of ice and some herbs on it,'" Brochu said. "Underneath, there's a lot of texture and fun and flavor going on." After taking a bite, he said, "At first I was going to say that was a failure. That bubble-gum thing is really killing me . . . but after you let it sit for a second it becomes enjoyable." At the same time, he found the flavors so intense that a little went a long way: "If I was to take four bites of this, I would probably be like, 'I didn't like that course.' If I was to take two bites, I'd be like, 'Wow, I remember that coconut-cajeta course, and that was awesome.'" 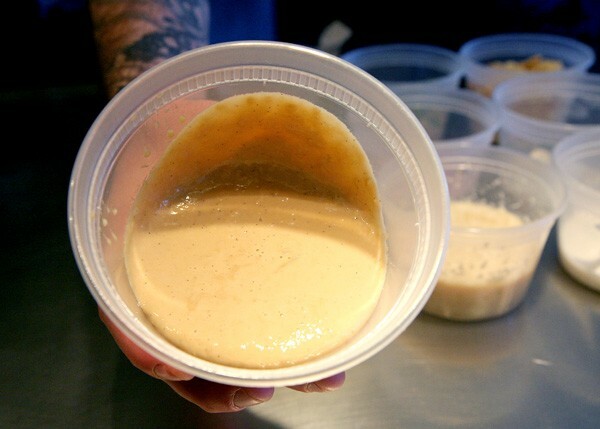 Despite the potential for overkill, "the cajeta comes through really nice," Brochu said. "It's got that barnyard goat quality that, even though it's sweet, almost cuts through the sweetness and the richness of all the coconut." Mike Bagale of Alinea, working with Necco Wafers. "I'm a huge fan of candy of all sorts," Brochu said. "Modern candy, old candy." In a medium pot bring contents to a boil and reduce to barely a simmer, let reduce until contents reach 200 grams. In a medium pot bring contents up to a boil and turn heat off. Whisk contents in a medium mixing bowl, slowly pour half of the boiled milk mixture in the bowl, whisking constantly. Once product is tempered place all back into to pot and slowly cook until custard is slightly thickened. Then put it into a blender and emulsify in 45 g of coconut oil. Let cool down in an ice bath. Season with a pinch of salt. In a mixing bowl whisk all ingredients together until pudding consistency. Strain through a chinois. In a pot bring all the contents to a boil except the gelatin, which should be blooming in cold water. Once it boils, pull off the heat and whisk in the gelatin, pour into deli cups and let set for 12 to 24 hours. Bring all liquids to a boil in a small sauce pan and pour over grated coconut. Let sit at room temperature for six hours, then refrigerate. Whisk all contents together and pour into a hotel pan. Place product in the freezer. Once completely frozen, scrape with a fork to produce ice crystals. Reserve in the freezer until ready to complete the dish.